We welcome you to our new website, which we couldn’t be more proud to launch with a “thank you” to Bloomingdale’s. 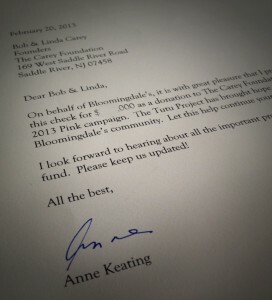 We’ve been keeping this secret since February, when our team received a Fedex envelope from Bloomingdale’s with their donation from the ‘Give Pink, Get More’ 2013 Campaign. Our team gathered at a diner to open it together. I want to tell you that we didn’t over-react, but there were tears. Thanks to this generous donation, Bloomingdale’s is enabling us to have a serious impact on the lives of families diagnosed with breast cancer. This donation will support hundreds with incidental costs as they journey through breast cancer. To distribute the funds we will be partnering with organizations that share our mission. Grant recipients will be announced throughout the year. To state that we’re thrilled would be an understatement! Flashback to May 24th, 2012; it was a day to remember. Okay, okay, that sounds like a title of a movie but it really was! Bob and I started our day with an interview on the Today Show, which is legitimately significant. After the show our adrenaline was running high and returning home seemed very anticlimactic, until – it wasn’t. Bear with me as I share the journey we have traveled with Bloomingdale’s, which thanks to their generosity, will help us deliver the promise to help hundreds of families with breast cancer. The first phone call that I received that May afternoon was from Anne Keating, Senior Vice President of Public Relations at Bloomingdale’s, she had watched our interview and was intrigued with The Tutu Project. I’m sure that I rambled, as I tend to do when I’m excited. The project had quickly gone viral and we hadn’t had much time to realize the impact or completely define our direction. So, my first thank you to Anne, I appreciate your patience with my high-speed chatter. 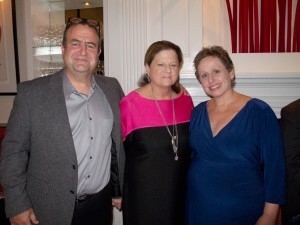 There is a long list of thanks for Bloomingdale’s, Anne and her remarkable team. But this one is particularly important; thank you for believing in Bob and I, thank you for your generous spirit and thank you for your willingness to support our project and our dream. By September, it was an absolute head rush to be able to stand on the trademark black and white checkerboard floors of Bloomingdale’s photographing Bob in his pink tutu. 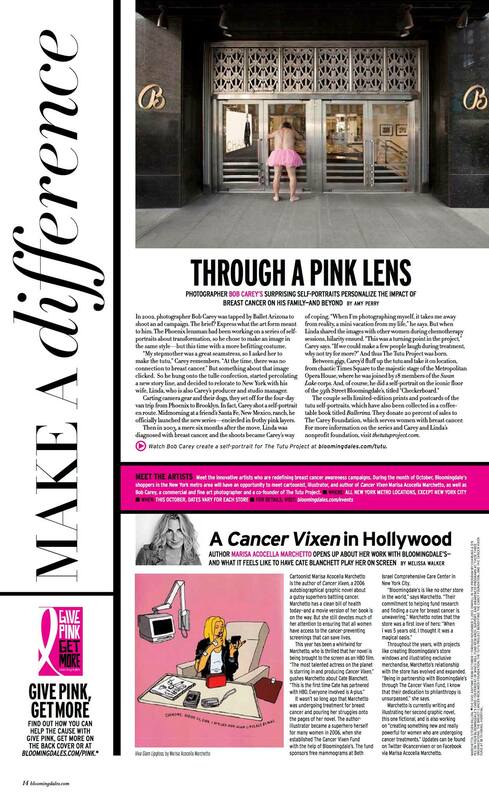 For breast cancer awareness month, our story was featured in the windows of the New York flagship store and our books were sold at an in-store book signing! In 2013, we were invited to tour Bloomingdale’s across the USA, be a part of a breast cancer survivor brunch in the New Jersey store and enjoyed a beautiful dinner alongside Elizabeth Hurley. Can you tell Bob was thrilled? We look forward to announcing our grant recipients and once again, thank you to Bloomingdale’s for being such an important part of the fight against breast cancer. I have ordered a book and a bag of postcards..the book came but the postcard did not…I am giving those postcard to people I know are going through chemotherapy…I was just wondering why it has not arrived…can someone let me know..
Hi Cynthia I am so sorry this was in our WordPress spam. Did you get your postcards? if not please email us at hello@thetutuproject.com and we will also email you from there.